This weekend we went to visit Ellie in Worcester as it is her birthday this week. For her birthday treat she wants to visit London and do some more museum visting (goodie!) which we will do later in the year.On Saturday we took a little trip to Stratford-on-Avon so we could visit some of the Shakespeare houses. For Ellie this was not only a day out but of course a field trip, she is doing a module on musuems at the moment and is very interested from a professional point of view about how things are displayed and how the information is presented. She is currently employed as a conservation assistant at a Tudor house owned by the National Trust in Worcester so was also very interested in how they were looking after the houses and was not impressed by the cobwebs and dust at one of them! It was a bit dull and cold so apologies for not having nice sunny pics to show you. 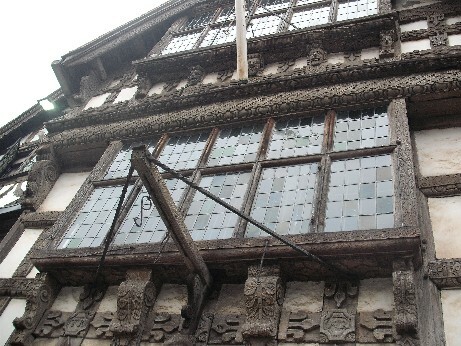 They also did not allow interior pics in Shakespeare’s house so have only got exterior pics to show you here. 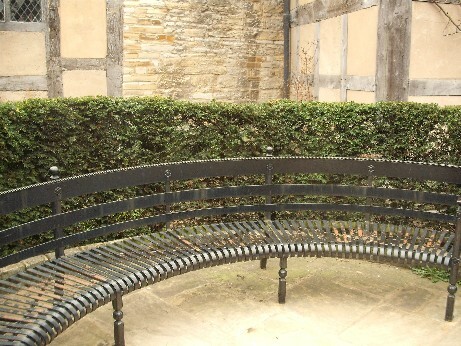 There were also very few textiles, there were some bedhangings and clothes in the house – Shakespeares’s father was a glove maker so there was a room laid out as his workshop but most of the textiles were very utilitarian apart from some lovely painted linen wall hangings which were very impressive. 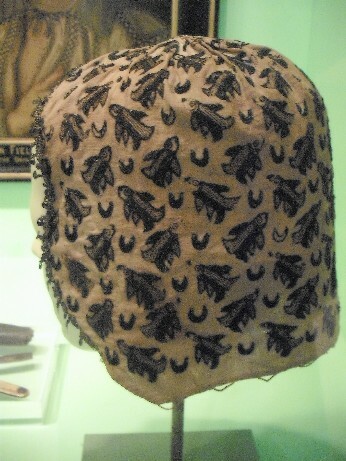 I did find a lovely blackwork coif in one of the other displays – apologies as it is a bit dark! We also went out for a meal with Ellie, my sister, nephew Sam, Jake and her friends. 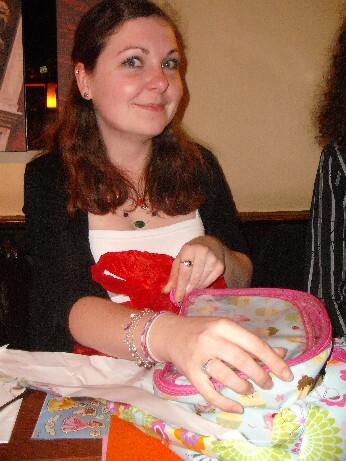 She really liked her birthday pressies which I hoped she would, I bought her Cath Kidston’s Stitch and Sew books, another craft /quilting book Simple Sewn Gifts by Helen Phillips and some pretty material and cup cake decorations and cases. 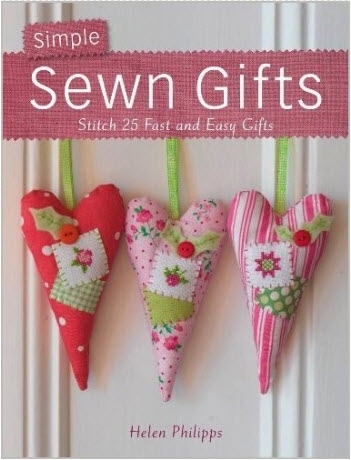 Look at those cute little patchwork hearts! It is brilliant having a daughter who enjoys the same stuff as I do and I am looking forward to borrowing the books as well when she comes home in the summer! I can’t believe that she will be 20 this week (she can’t either!) she is so grown up now and very lovely! 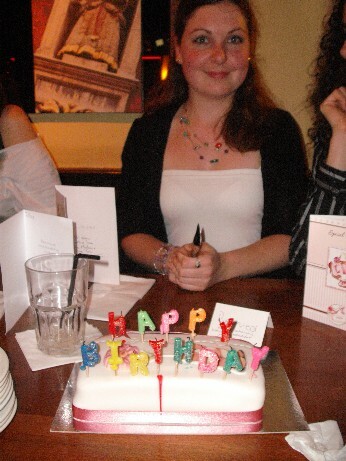 Can't fit that many candles on the cake so she had to make do with the words instead! I have finished the red chunky wool hat so will get some pics of me modelling it – it has been so nice and warm here that hopefully it is going to straight into the drawer. I managed to get lots done to the garden last week and it is lovely and sunny again today, it is so nice to have an extra hour of daylight in the evenings now so I will have chance to do a bit more pottering later on. 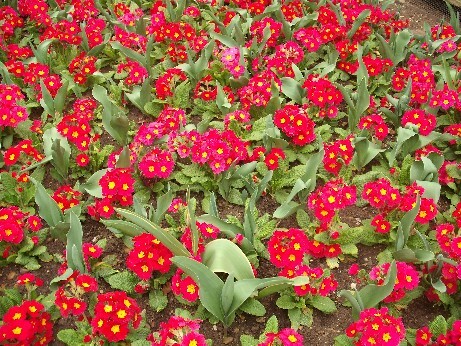 I am planning a trip to the garden centre this Sun (as it is Mother’s Day) to buy myself some pretty primulas and lillies for the empty pots. 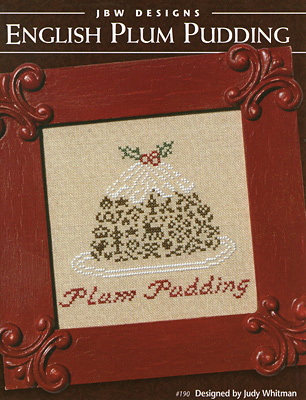 I am working on a cross stitch exchange for Spring so won’t be able to show you that for a while but have also made a good start on my next Xmas ornie – am doing the JBW Xmas pudding – bit late with this one as it was supposed to be the March finish but better late than never! Hope that you have all had a lovely week and thank you for visiting.